Nandamuri Balakrishna is a happy person in both personal and professional lives. His grandson Devansh has become his stress buster. 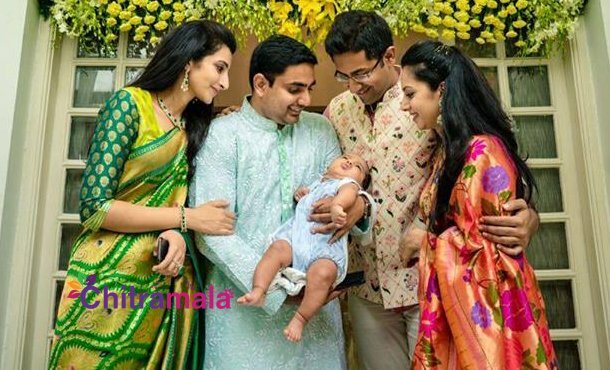 Now, we have come to know that a new addition to the family has filled happiness to Balakrishna. On March 22nd, Balayya Babu’s second daughter Tejaswini has given birth to a baby boy. Tejaswini is married to Sri Bharath and the couple has named the boy as Arya Veer. The news is revealed by Nara Lokesh on Twitter. Sharing the pictures of Arya Veer with his parents, Lokesh congratulated the new couple and wished the sweet times ahead for them. “Hearty congratulations to Bharat and Tejaswini! Aryaveer is one lucky baby to have you both as parents. Wishing you sweet times.” tweeted Nara Lokesh.